How to Protect Baby’s Hearing? ​​​Growing ears of babies and toddlers are susceptible to damage. Ears and hearing develop significantly in the first few years after birth. 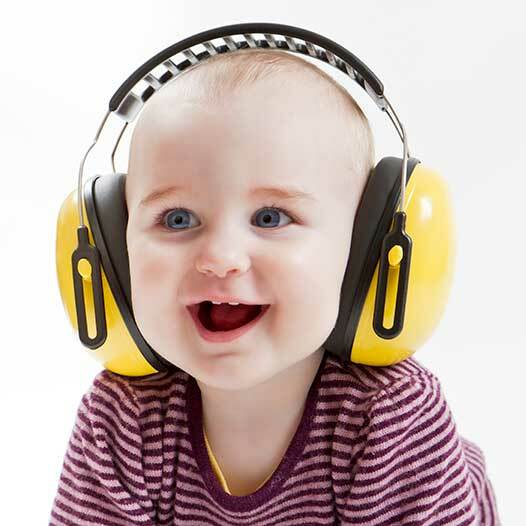 Providing hearing protection, especially at a young age, helps to ensure optimal hearing as your child grows. Infants and young children are more sensitive to loud noises than adults are. Because the ear canal is smaller in children, the sound pressure that is generated in the ears is greater compared to adults. In other words, loud sounds are even louder for kids. Hearing damage due to noise exposure is permanent and cumulative. It is important to monitor your child’s surroundings for noise exposure that exceeds recommended levels. Sounds are measured in decibels (dB). Safe sound levels vary based on the duration exposure. In general, noises softer than 80 dB will not damage hearing unless the exposure lasts for several hours. Noise-making toys are popular. Some of these toys can produce sounds in excess of 120 dB. If possible, listen to toys before purchasing to see if the sounds are too loud. Remove the batteries from toys with excessive noise levels. Because children play with toys much closer to their faces and ears, even sounds in the 80-90 dB range can be damaging. The amount of time an infant is exposed to sound is important. If you’re using an infant sleep machine, test the sound output before leaving it in a room with a sleeping child, and use the lowest volume setting possible. Additionally, parents should place the machine as far from the baby’s crib or bed as possible. A simple internet search will show numerous vendors with earmuffs and noise cancelling headphones for babies and children. These are small enough to fit snugly on a child’s head. Earplugs are not recommended for infants, toddlers or very young children, as they are small enough to present a choking hazard. Older children can use ear putty or appropriate sized ear plugs to protect hearing.